Red Onion Marmalade with fiery Birds eye Chillies beware this is hot. Heat Level = Hot. 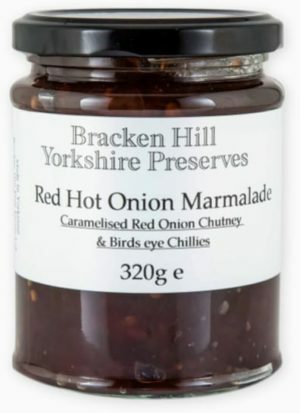 a great spicy hot chutney, good with cold meats, cheese, sausages and anything else in the savoury line. Lovely product , gives a lovely “bite” to any sandwich! Red Onions 67%, Sugar 19%, White Wine Vinegar, Balsamic Vinegar, Birds Eye Chillies 1%, Sea Salt, Spices.